Sewage sludge: A material composed of human waste and an abundance of other unappetizing elements that is dehydrated into “cake” and spread on farm fields as fertilizer for the food you eat. What a lovely mental image. Sludge (or biosolids, a polite euphemism used by those who promote its use) has become quite common on Pennsylvania farm fields, much to the dismay of residents whose communities abut factory farms that liberally spread the muck on their fields. These citizens have good reason for their fear. According to a statement by the Community Environmental Legal Defense Fund, the sludge “can contain any number of over 100,000 toxins, pathogens and poisons, such as heavy metals, PCBs, pathogens, carcinogens, pesticides [and] industrial solvents” that can devastate human health and harm the environment. There have, in fact, been numerous illnesses and several deaths in Pennsylvania that have been attributed to exposure to toxic sludge. In 2005 the General Assembly passed and Governor Ed Rendell signed the ACRE law that authorizes the state Attorney General to overrule local ordinances affecting farming practices, including the spreading of sewage sludge. Since the passage of the law more than a dozen municipalities with serious concerns about the health and safety of their residents have enacted local ordinances banning the use of sludge on farm fields in their communities. If you remember from an earlier post on this blog, “Quid pro quo”, gubernatorial candidate Attorney General Tom Corbett is a former lobbyist for Waste Management, a sludge hauler and contributor to Mr. Corbett’s campaign. Is it surprising, then, to learn that Mr. Corbett has filed lawsuits against these communities to prevent them from enforcing the ordinances they enacted to protect the health of their families and the safety of their environment? Fortunately for at least one community – Packer Township in Carbon County – Commonwealth Court on March 17 ruled against Mr. Corbett’s suit to overturn their anti-sludge ordinance. 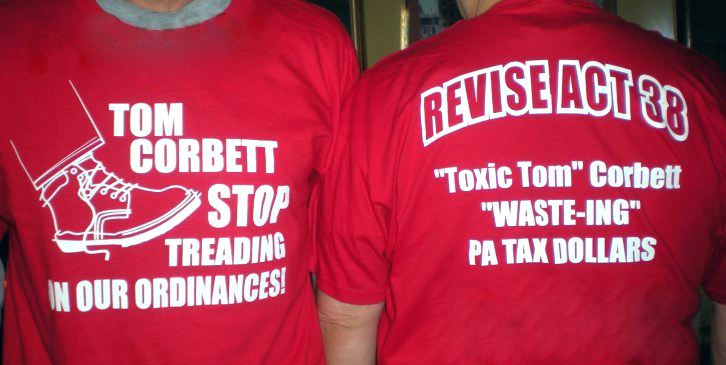 Mr. Corbett, why are you wasting funding and resources pursuing these lawsuits, especially since you recently testified before the House Appropriations Committee that the Attorney General’s office is having budget problems? Is this being a good steward of the taxpayers’ money? Worse, Mr. Corbett, is that these suits benefit no one but the factory farmers and sludge haulers. They hurt the very people you are sworn to serve when their only crime is trying to protect their property and the welfare of their families. If you are elected, is this an example of how little regard you will have for the citizens of Pennsylvania when the special interests demand their payback? That, Mr. Corbett, stinks worse than the sludge. For a similar viewpoint with a slightly different slant, check the blog by former PA State Representative Frank LaGrotta. This entry was posted on Wednesday, May 5th, 2010 at 11:58 pm and is filed under Uncategorized. You can follow any responses to this entry through the RSS 2.0 feed. You can leave a response, or trackback from your own site. 4 Responses to Wow, that really stinks! OH MY GOD. I’m speechless. There are two sides to every story and I would love to hear Tom Corbett explain how and why it was critical to paste sludge–so much so that he utilized tax dollars, and was willing to sacrifice human welfare. It’s time for people to wake up and smell the stench. It is time PA voters demand that our elected officials have PA families best interest at heart. People need to be aware of who is funding their campaigns. Only when we educate and demand change, will PA families have true representation. Thanks for getting the message out. The video link to the rally that you’ve posted is MUCH better than the one used above. It’s definitely worth watching. This is really disturbing that he would protect a company with numerous health violations at the expense of human welfare. I guess it isn’t too surprising though. Its the corporate/ government revolving door.